Over the last 20 years, Vintage Graphic Solutions has helped some of the most successful brands across US sell their products with our Packaging Solutions. Vintage is a great resource for custom printed paperboard boxes and litho-laminated corrugated boxes. Whether you need a quick turn around on a few hundred custom boxes or a large production run that needs to be warehoused and shipped over time Vintage will help you with any of your packaging needs. There are hundreds of thousands of labels fighting for the spotlight. The only way your product is going to stand out from the rest is to make it not only functional, but exciting. That’s what we do. We have the capabilities to create must-see artwork for your label, and offer a variety of printing options including digital, flexographic and wide format. 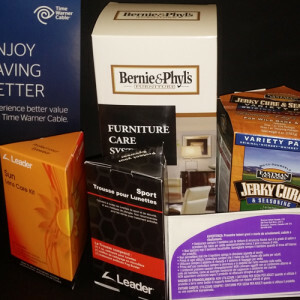 Our full service capabilities allow us to provide custom labels, laser labels, thermal labels for any type of application from your warehouse to 10 color prime labels for retail. Whether it’s a warning label for an industrial cylinder product or an ingredient listing for food and beverage products—we do it all. Want your wine bottle to be the focal point on the store shelf? We can make it dazzle with our full color printing processes. Need a label that will hold up in negative 32 degree temperature? No problem, we’ve got labels that will handle all types of temperatures. Looking for something that is more than just a label? We offer Tags on a Roll®, a product so unique it’s patented! With multiple production facilities, your labels and packaging products are printed and assembled locally under one roof to lower costs, improve turnaround times, and maintain high levels of quality. Our team of packaging experts can quickly provide you with a correct layout and custom cut out samples to help you visualize your finished product. We love new challenges, give us your best shot! For quality, performance and cost effective label and packaging solutions email us or call 508-699-3944 today for assistance.